SCT 2014 -stellt den State of the Art im Automobilbau mit Stahl dar. Ob Lang- oder Flachprodukte, tailored oder spezielle hochfeste Produkte, Oberflächenbehandlung oder Crashtests - hier wurde das Know-how führender Spezialisten aus aller Welt zusammengetragen. 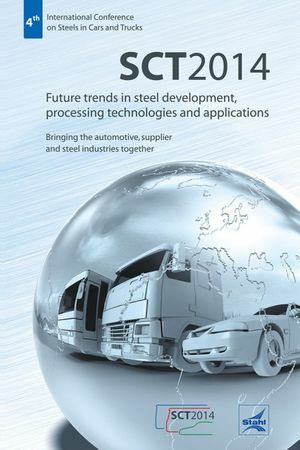 'Bringing the automotive, supplier and steel industries together' is one of the two goals behind SCT 2014. This motto reinforces what the modern steel industry is all about: partnerships across value chains being made up of industry, research and development professionals. The second motto of SCT 2014 is: ' Future trends in steel development, processing technologies and applications'. The ability to steadily innovate materials for industrial use is reflected in the increasing amount of steel being consumed all over the world. Steel delivers a lot of solutions for solving such future global challenges as electro mobility or the preservation of material resources due to steel's excellent possibilities for recycling.